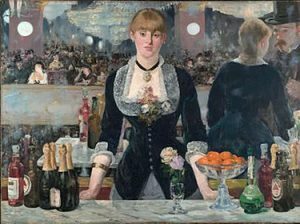 After ArtSeed at The Marble House Colony my friend, Artist Leslie Fry said to me: “For a brief moment this is how I saw you tonight.” She was referring to this painting: A Bar at the Folies-Bergère painted and exhibited at the Paris Salon in 1882. It was the last major work by French painter Édouard Manet. I just got back from Northern Ireland where I was working on my book Here but Often There: TheClinical Adventures of a Bullet-Proof Therapist that was my central project at Marble House. In Belfast I interviewed ex-paramilitary leaders who lead their communities toward peace, transitioning from military to civic leadership. Back in Boston I got news of the death of Father Daly. The BBC photo below depicts the events of Jan. 30, 1972, as a 38-year-old curate at St. Eugene’s Cathedral, Father Daly escorted unarmed protesters on a march toward the city center when British soldiers opened fire, resulting in the deaths of 14 people. The massacre became known as Bloody Sunday. 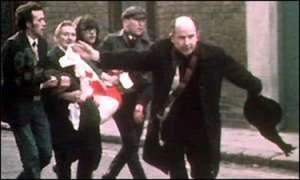 Father Edward Daly leads a group of people carrying the mortally wounded Jackie Duddy, waving a white handkerchief. These images sharply contrast but they both matter. The first is about artistic imagination; the second is about moral imagination. Michelle Maiese, of the Conflict Research Consortium, describes John Lederach’s idea of “moral imagination” as the capacity to recognize turning points and possibilities in order to venture down unknown paths and create what does not yet exist. In reference to peace building, the moral imagination is the capacity to imagine and generate constructive processes that are rooted in the day-to-day challenges of violence and yet transcend these destructive patterns. In Lederach’s view, the moments of possibility that pave the way for constructive change processes do not emerge through the rote application of a set of techniques or strategies, but rather arise out of something that approximates an artistic process. I want to thank my friends at Resolve, ACT, EPIC, Northern Ireland Alternatives, Cogus, Shankhill Falls Community Council, Gary Crooks, Gary and Joyce Mason, Brian Ervine, JIm Wilson, Phil D and Beverly, Jamie at Belfast City, Cafe Nerro, IPWRA, and Martin the taxi driver for their stories, and the moral imagination that has fostered their commitment to restorative justice. As for the stories? You’ll have to buy the book!